Be aware that heavy metal essentials, Motorhead, are back for more "Sustainnnnnn!" this autumn. Just six months after releasing, 'Motorizer', their nineteenth studio album in 31 years, these young-at-hearts have announced they will go on a two-week UK road trip in November. The tour will kick off on November 11th at the Plymouth Pavilion, stopping by Nottingham Royal Concert Hall on November 16th, Newcastle City Hallon November 17th, Glasgow Academy on November 19th, Leeds Academy on November 20th, Manchester Apollo on November21st, Bournemouth Solent Hall on November 27th, London Hammersmith (by then, cursedly renamed HMV) Apollo on November 28th, and will terminate at Wolverhampton Civic Hall on November 29th. 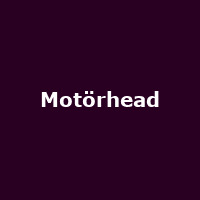 Meanwhile, 'Lemmy', a rockumentary about the Motorhead majesty will be released, and will feature friends and peers including, Dave Grohl, Slash, Ozzy Osbourne, Johnny Knoxwille and Marky Ramone ,among others. Tickets for the 'Motorizer' tour are on sale now and cost £25 for all dates, except for London for which they cost £30. All tickets, subject to a booking fee.